It’s Oscar Night. The red carpet is rocking. The TV is blaring. You’ve got your award predictions on hand. Where do you turn to for a second screen? For millions of people, the answer is Twitter and Facebook. And a good chunk of them look specifically to Entertainment Weekly. Entertainment Weekly has 3.5 million followers on Twitter. They have over 2 million Likes on their Facebook page. Throw in a few hundred thousand additional followers on Instagram, Pinterest and Tumblr, and you can see why the organization has become a leading source for entertainment news on social media. With that many followers, you might expect Entertainment Weekly to have a big marketing team managing their social presence. Really, it’s only three people. 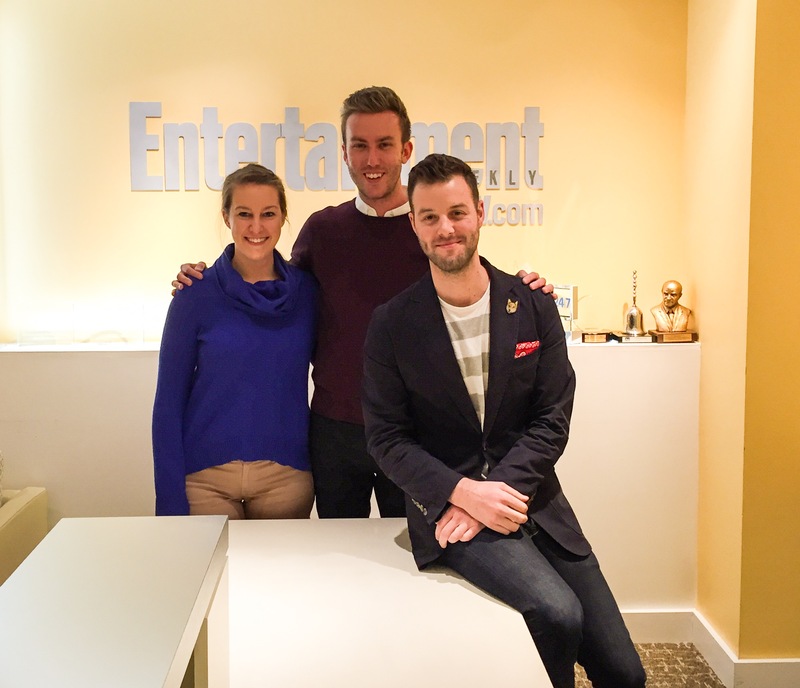 Led by Senior Social Media Editor Chris Rackliffe, Entertainment Weekly proves that small teams can do big things on social media. In entertainment news, there is no bigger day than the Oscars. A year’s worth of films are pitted against one another, as are all the people who worked on them (and their wardrobes). This is reflected in massive social media activity. 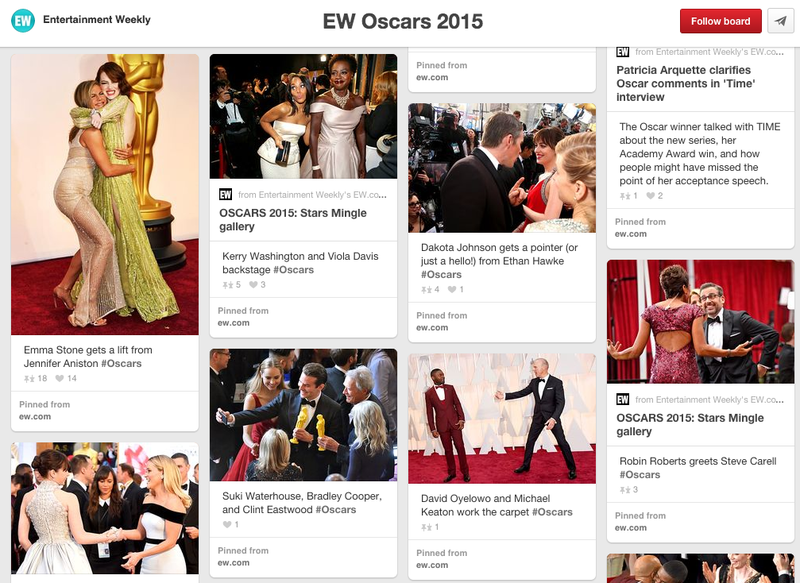 There were close to 6 million Oscar-related Tweets the night of the event this year. On Facebook, 21 million people engaged in some type of Oscars discussion. It comes as no surprise then that for the Entertainment Weekly team Oscar night is the biggest game day of the year. It’s an event that requires the right tools and a good amount of planning. Entertainment Weekly’s social media team, from left: Allison Toner, Chris Rackliffe, and Ben Boskovich. A small social media team depends on technology to execute quickly, efficiently, and without error. Rackliffe’s team has several go-to tools that they use for every important event, allowing them to maintain a half-dozen social networks, engage their followers and respond to news in real time. First, the team uses Slack to communicate internally with staff at Entertainment Weekly. Beyond Slack, the EW team uses Hootsuite, specifically the Hootlet which Rackliffe says allows them to be more agile as publishers. They pin social networks to their publisher so they don’t have to select them every time, they add a photo to the auto-filled headline and link and then publish, all within a few seconds. Of course, depending so heavily on technology always comes with risks. During the Super Bowl, Slingbox went down so the EW team was forced to take photos of an actual television screen with their phones, and use these lesser quality images for social media messaging. While it wasn’t an ideal situation, their planning ensured they didn’t miss a moment. Beyond having their tools in hand, there are a few important ways Rackliffe’s team prepares for the Oscars, or any big award show. “We pull social media handles for all the talent and all of the projects for any given award show so we don’t delay how agile we are in real-time,” Rackliffe said. While this preparation goes a long way when the event is rapidly unfolding in front of them, its value is really in that it allows the EW team to be agile. Depending on the size of the award show, the Entertainment Weekly team might start preparing assets a week or two in advance. Chris usually takes care of driving traffic to their website through Twitter, Facebook and Google+. Assistant social media manager Ben Boskovich does live commentary on Twitter, and uses slingbox to capture real-time moments like a photo bomb or surprise appearance. Assistant social media manager Allison Toner focuses primarily on posting to Pinterest (specifically their red carpet gallery), Tumblr, and Instagram. Once they were finished preparations, the team shifted focus to real-time marketing, their real bread and butter. That groove involves knowing what to look at for, what their audience is most interested in, and how to get it onto social networks as fast as possible. The Entertainment Weekly team can’t anticipate what will happen during the show, so they have to excel at providing real-time coverage of these major events. Upwards of 75 per cent of content about award shows happens during the events themselves, and the team will post a remarkable 600 or 700 times in that short span. During the Oscars this year, the EW team tweeted out a photo of Patricia Arquette with a quote from her speech on women’s equality. The Tweet earned well over 5000 retweets, as they were one of the first outlets to share that information. Throughout the night Rackliffe also monitors Chartbeat to see what content is connecting with their fan base, and then doubles down on it. This process might extend until three or four in the morning, as EW’s content team churns out stories, everything from speech round-ups to ranking the host’s jokes. As a publisher, Entertainment Weekly uses social media to drive traffic to their web properties. This is an essential part of what they do, and they’re good at it. Then, after every event, they pull together pretty comprehensive reports on total social interactions. They sit down and talk about how things went, what they could have improved, or any moments they could have capitalized on.This information is used to constantly improve their game day efforts, helping the team remain at the forefront of entertainment news on social media. The lessons they learned from the Golden Globes, for example, might become useful as they take on the Oscars. Be agile during events. Don’t just stick to a content calendar. People want to share in an event’s big moments. Try and be the first to provide that content to them. Learn how sports, media, and entertainment brands are getting real results from social in our latest white paper.